Special Containment Procedures: The concrete bunker built around SCP-3513 is to be guarded and maintained by four permanent staff, maintaining the cover story of a water pumping station. Undercover Foundation agents are to be placed in all Namibian hospitals to cover up pathological reports suggesting the influence of SCP-3513. Any atypical increase in clinical rates of degenerative brain disease in a highly localised area is to be investigated as a potential further instance of SCP-3513. Description: SCP-3513 is a region of space located in Rocky Crest, Windhoek, Namibia. It is approximately cylindrical in shape, with a diameter of 3.4m and a height above ground of 2.3m. Excavations have revealed that SCP-3513 extends below the ground for at least 10m, but its total depth has not been measured. A hard keratin nub develops in the cerebrum. The keratinized area grows in proportion to the overall size of the brain; in humans, it becomes approximately 5cm across. The tip of the keratin nub opens, forming a beak. 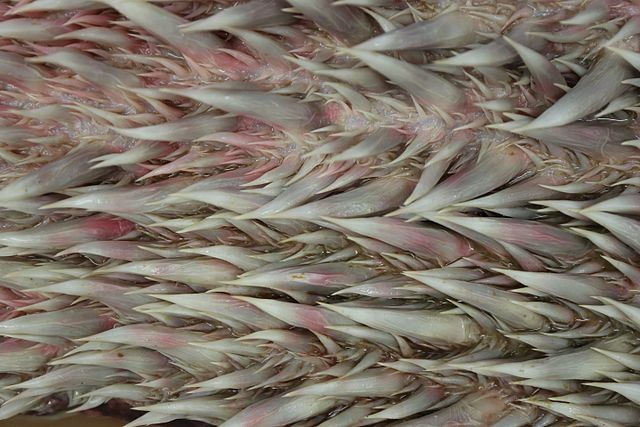 The interior of the beak is coated in pointed, keratin papillae (see image). Over a period of months, the beak slowly ingests brain tissue, consuming it. The papillae assist in ensuring that the soft brain matter does not slip out of the beak once it enters. Brain tissue consumed by the beak disappears from the patient's brain - testing indicates that the interior of the beak leads to an intra-dimensional portal to another location or locations. The external symptoms of the SCP-3513 disease depend largely on where in the brain the keratin nub initially forms, but may be misdiagnosed as Creutzfeldt–Jakob, Huntington's, Parkinson's or Alzheimer's disease (and was initially thought by the Foundation to be SCP-1693). Confirmation of the effects of SCP-3513 is only possible through MRI or CT scan, open neurosurgery or autopsy. Foundation autopsies have confirmed that, following the death of the patient, the beak continues to ingest any remaining brain tissue. Procedure: Six D-Class were exposed to SCP-3513, and regular CT scans performed to track the progression of the disease. Upon the opening of the beak, Foundation medical staff performed conventional open neurosurgery on the relevant D-Class. The use of human test subjects was approved based on the requirements for brain size and ease of anaesthesia. During surgery, unnecessary brain tissue was removed to allow access to the beak. A microscopic surgical camera, fitted with a GPS tracking chip, was fed slowly into the beak and the results recorded and analysed. Results: Inside the SCP-3513 beak, the camera filmed a passage lined with papillae. The camera was fed into this passage for a distance of 1.4m. The GPS tracker was not able to be located during this time. D-2879 reported no discomfort. After the camera had progressed approximately 0.8m, the passage ended and the camera emerged into a dark hemispherical space. A number of openings were observed at intervals around the sides of this space. After consultation, the surgical team proceeded to feed in the camera filament, allowing the camera to enter into the opening on the opposite wall of the space. The opening led to another passage lined with papillae, although observers noted that the direction of papillae was reversed. At 1.4m, the camera emerged from the interior of another keratin beak into what appeared to be further brain tissue. At this point, a GPS signal was obtained, registering the camera's location in Reedsburg, Wisconsin. After a short delay, the GPS signal became mobile. Local Foundation assets followed the signal to the Reedsburg Area Medical Center, where it was tracked to a recently deceased patient, Norman Miller. Mr Miller had suffered a stroke, presumed to be caused by the sudden appearance of the camera within his brain. The camera was retracted through the beak in Mr Miller's brain, back through the passages and the beak in D-2879's brain, and D-2879 was returned to monitoring without complications from surgery. Results: The camera filmed a passage lined with papillae for approximately 0.7m, entering a similar hemispherical space to that observed in Exploration 3513-1 and being fed into an opening opposite its point of entry. After progress down a second passage for a further 0.8m, the camera emerged from a second beak and filmed unidentified tissue, which appeared to be in motion. This movement continued for 8 seconds before the camera malfunctioned and lost picture. The camera was withdrawn from the passages and found to have been crushed. The GPS signal from the camera was traced to a location outside Naples, Italy. Further investigation revealed the coordinates belonged to a Cremonini meat processing plant. A later biopsy of D-4353 revealed trace amounts of processed meat within his brain. Transfer of the meat into D-4353's brain is thought to have occurred during the recovery of the camera from its alternate location, which appears to have allowed material from that location to travel back along with the camera. Results: After the camera had progressed approximately 0.6m, it emerged into the hemispherical space. An accidental mis-feeding of the filament resulted in a change in the camera's alignment within this space, with the camera facing downwards towards a wider opening at the base of the chamber. The camera was fed into this opening, filming a papillae-lined passage which extended for more than 2.5m. No reversal of papillae was observed, and the passage was observed to grow wider as it continued. After progressing for approximately 3m, the camera feed suddenly cut out. No GPS signal was located. Upon retrieving the camera filament, attending medical staff noted that the camera was missing and that the end of the filament appeared to have melted. Five seconds later, a high pressure jet of molten metal began to spray from the incision in D-3956's brain. D-3956 and all attending medical personnel were killed. Following recontainment of the laboratory, analysis confirmed the presence of several hundred kilograms of iron-nickel alloy. Initial temperature of the molten metal is estimated to have been up to 4000 Kelvin.